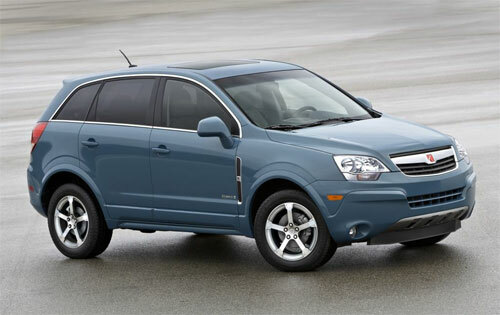 DETROIT — General Motors is trumpeting a pair of numbers about its 2008 Saturn Vue Green Line today. The hybrid SUV’s fuel economy numbers are 25 mpg in the city and 32 mpg on the highway, which represents a 27 percent improvement over the non-hybrid Vue. And the small SUV will start at $24,795. Those figures mean it’s the highest-mileage SUV on the market — and the cheapest hybrid SUV. Fuel economy was calculated by the EPA using the new 2008 test procedure. GM points out that these numbers put the Vue Green Line ahead of both the Honda CR-V and the Toyota RAV4. Gives Us Back Our Jaguar XF! Previously, the VUE Green Line was classified as a mild hybrid and I agree its fuel economy is weak compared to other hybrid models. Heck the GMC Yukon Hybrid, with a gorilla V8, can get better gas mileage than the VUE Green Line. 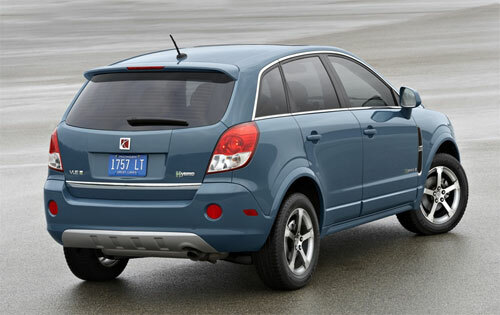 GM got around to installing the 2-mode hybrid system (same as the GMC Yukon/Chevy Tahoe) into the VUE Green Line. We are testing the Saturn later this month and will report back our fuel economy numbers. After 5 tanks this car can’t break 20 MPG. Took the car in only to have them “test” it and they “claim” it gets 24-25 MPG. With an 18 gallon tanks that means I should get 432-450 miles on a tank, I have not broken 305, which is 17 MPG. Other than losing $20-$30 per fill up (@$4.25 pr gallon) it’s a nice car, but to call it a Hybrid is a Lie!